Back in 1997 Tom Boylan received a call from a friend asking if he was interested in talking with the owner of a Dodge dealership who was looking for a new creative advertising agency. A brief meeting took place where some clever ideas were shared. The Boylan Point Agency opened its doors 30 days later with Santa Rosa Dodge as its first client. It did not take long to bring in our second client, Buffalo Billiards, as another cornerstone that remains a client today. Over the years, our bay area marketing agency has acquired many more clients and can take pride in having a diverse base of corporations, member-based associations, retail businesses and non-profit organizations. Our client diversity is an asset to our clients, because there are opportunities to pass along best practices of one industry to another. To date, our primary client base is located in the San Francisco North Bay Area. We have expanded our local marketing agency by delivering our services and products throughout California, Oregon and Nevada. 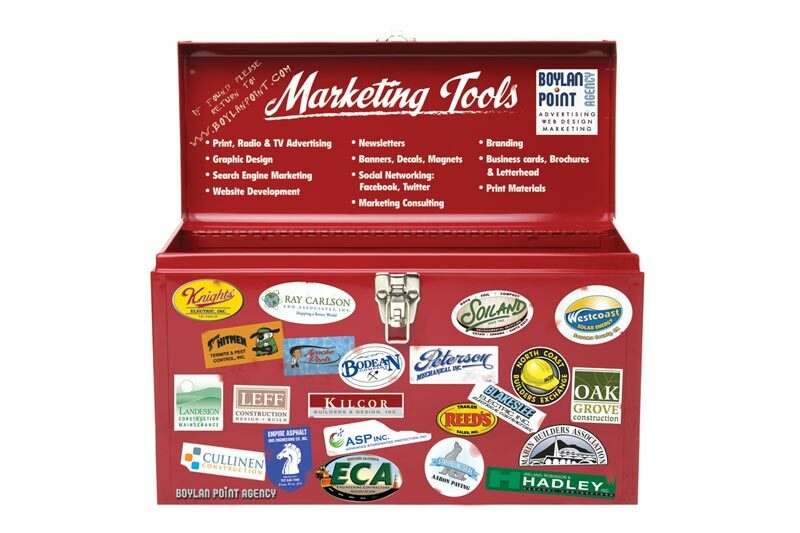 We also provide marketing materials for international distribution and promotional products. We have many cost-saving solutions for those who want to have the materials created locally for a foreign marketplace. If you need a great excuse to spend time in the wine country of Northern California, we look forward to introducing you to the region. The Boylan Point team creates brand awareness for our clients through a variety of real-world media and online platforms. Our graphic design services include logo development, collateral materials and marketing materials from point of purchase to newspapers, magazines and online media. Working with production teams from the Bay Area and beyond, we have developed videos for commercials, corporate videos, and web videos. Our production includes creative development and production from concept to script. Delivering creative website design in Sonoma County and throughout the Greater San Francisco Bay Area. Our Santa Rosa Web Design team is responsible for the development of e-commerce, institutional sites, and general site development. Platforms we work with include WordPress, Drupal, Joomla, and MODx, to name a few. We build new websites and we service websites others have built. We started building sites in 2004 and have progressed with each new launch. The team takes great pride in offering a very hands-on approach to your website. Be one of many clients who come in to our local Santa Rosa office to have changes made to your website in real-time! Search engine marketing programs include options for Search Engine Optimization (SEO). We pride ourselves in being one of the top SEO companies in Santa Rosa with a highly competitive and effective seo campaign. Some clients need more than others and we do not place every client into the same program. We offer social media marketing programs as well, and like the SEO programs, it is always best to communicate with us and let us help create a plan that is specific to your needs. Our marketing agency has a strong public relations perspective, with our founder having more than 10 years of experience as a contract columnist/editor for the New York Times-owned Press Democrat and several additional years as a business columnist for the Gannet-owned Marin & Sonoma Gazette. Our press relations incorporates both conventional media and web-based media. If we cannot get you published in other platforms, we will create a publication of your own. Creativity isn’t confined to larger markets. Our agency is located in the heart of Wine Country and that alone should prove how clever we are. If we successfully retained your attention through all of this information, take a moment and contact us here. Our mission is to provide our total attention and creative resources to meet our clients’ marketing and advertising needs. We pledge to do this in an honest and professional manner. Pay attention when the client speaks. Do the creative homework that will address what needs to be done. Explore and nurture fresh ideas. Don’t overcharge for what you do. Remember to thank the people you work for and with. We are a strong bay area SEO company providing marketing consulting, web development, social media strategies, advertising and media placement for a diverse group of clients that is measurable and result oriented.